When it comes to breakfast, I need something that's quick, easy and delicious. Why? Well, aside from the fact that breakfast is my favourite meal of the day, but also because I'm really super duper clumsy in the morning. That clumsiness has it's benefits though - it meant I found myself creating delicious make ahead breakfast recipes like this one. You see, cereal or toast just doesn't cut it for my voracious appetite first thing in the morning. 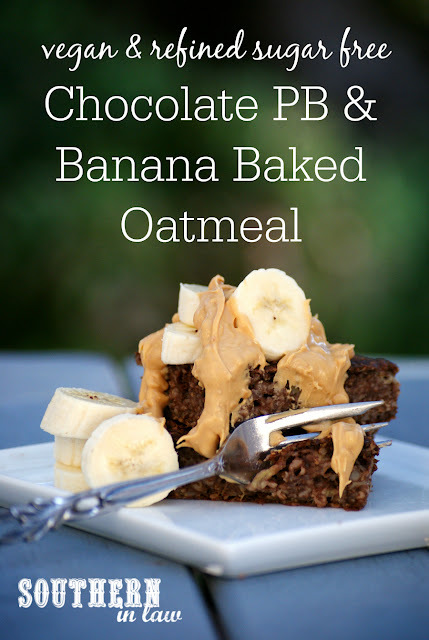 I need something filling and delicious.... and the only thing better than breakfast is dessert for breakfast - and that's where this recipe comes in. 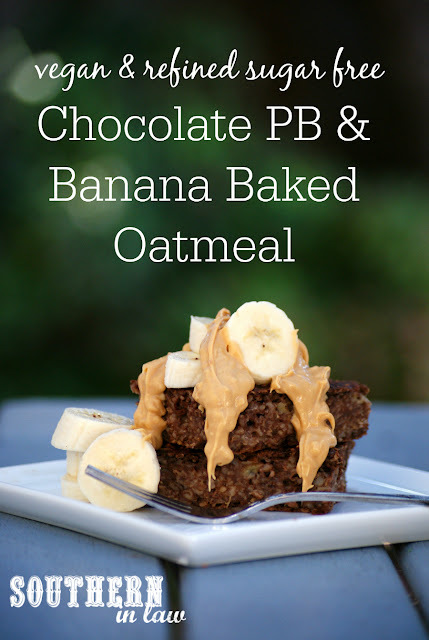 This Chocolate Peanut Butter and Banana Baked Oatmeal is a healthy breakfast recipe that totally doesn't seem healthy at all. Even better than that, it's also super simple to make and can be made in a big batch and either frozen or kept in the fridge for the week ahead. I usually make this up in a big batch (as well as some of my other breakfast bake recipes) and then freeze them in individual slices so all I have to do is pop them in the fridge the night before to defrost and smother them with toppings in the morning. In a mixing bowl, mash your bananas and mix in your applesauce, milk, vanilla and sugar/sweetener (if using). Add in your oats, peanut flour, cocoa powder, baking powder, baking soda and salt and mix until combined. Pour your mixture into your lined tin and bake for 30-50 minutes (baking time will vary depending on thickness) or until your oatmeal is cooked through and firm to touch. Allow to cool slightly before slicing and serving or allow to cool completely before slicing and storing in an airtight container in the fridge to enjoy later. This baked oatmeal also freezes perfectly - simply store slices in individual ziplock bags and defrost in the fridge overnight or in the microwave when you're ready to eat. Serve with toppings of your choice or enjoy on its own! *If you want to add a little more nutrition and protein, switch out the applesauce for an egg! **Find out more about oats on a gluten free diet. If you can't eat oats, you can use quinoa flakes instead, however, this will give you a completely different taste and you may need to add additional sweetener to counteract the bitterness. 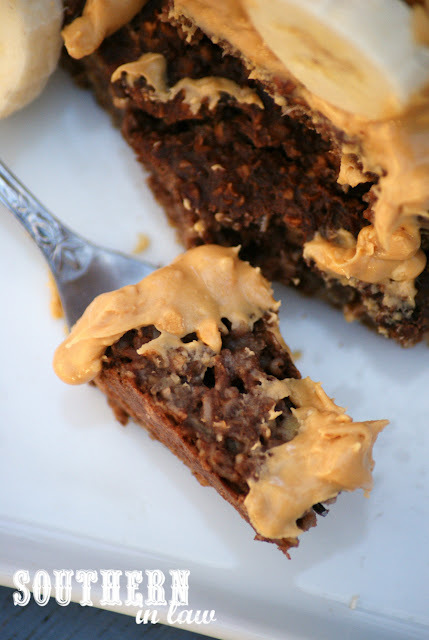 ***You can leave the peanut flour out if you don't have it - or you can replace it with protein powder. If leaving it out entirely, use 1/4 cup less milk. But tell me, what is your go-to breakfast at the moment? Are you a make ahead breakfast fan, a quick and easy fan or are you in the kitchen cooking up a storm?